Hello to all my blogger friends, I have just come back from a very interesting holiday I must say, to Scandinavia, Russia and Italy. As much as I have loved every inch every sight, smell and sound, I am glad to be home. I will be posting more about my holidays over the coming weeks, so do drop in. I will be focusing on the essence of my blog which is spirituality, on what I have learnt and that which I can share with you. 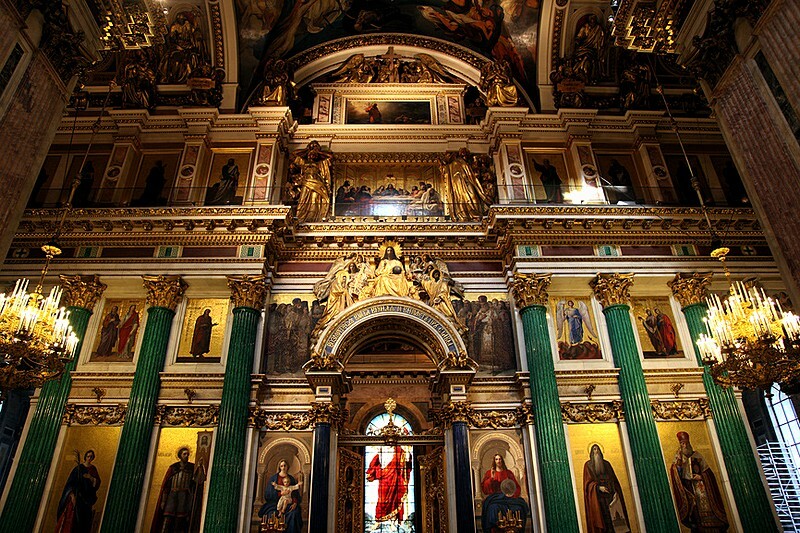 One of my highlights was the cathedral of St. Isaac in St. Petersburg-Russia. 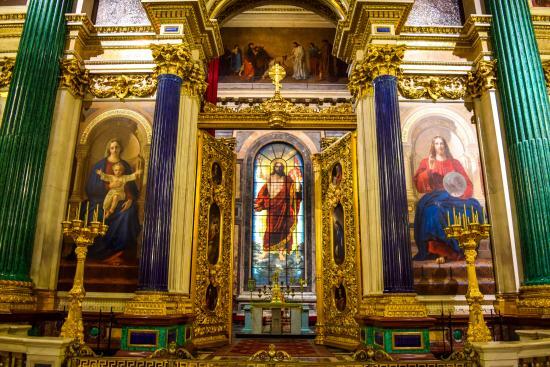 St. Isaac’s Cathedral was originally the city’s main church and the largest cathedral in Russia. It was built between 1818 and 1858, by the French-born architect Auguste Montferrand, to be one of the most impressive landmarks of the Russian Imperial capital (very romanesque indeed). What got me was, this super large imposing figure of Jesus Christ (see below and this photo does not do it justice) behind an intricate gold worked, gate with hand painted cameos of other images of Christ. So at the opening of a service, the gates would open and the first thing you would see is Jesus, giving the illusion that He is moving. So beautiful that it gave me an appreciation of the spirit of the artist and his faith. Without the faith, I don’t believe the artist would have captured the essence of what Jesus is about. How wonderful to start a church service with this- a triumphant Jesus who is there to greet you, to remind you that He is there for you, there to remind you that we are a resurrection people. Jesus suffered for us by giving His life for us on the cross, but he doesn’t expect us all to die on a cross, what He wants is our faith, love and our trust in Him. Unfortunately, it’s only used for special occasions and not for regular Sunday service, it mostly serves as a museum. This saddens me because in these difficult times, we need Jesus more than ever. I noticed also how much Mary was revered back then also, she is on the left with baby Jesus. On another note, St. Petersburg was one of the hardest cities to visit, you need a visa and there still learning to deal with tourists. They are restoring it’s beautiful architecture, its palaces and churches and state buildings. I couldn’t help notice how there is a really rich and really poor class, I didn’t really see a middle class. I like to reply to people who are interested in my comments and bring light into their world. Please visit often.